I left Whitehawk Secondary Modern School in 1964 & being an outdoor type of girl went to work as a market gardener for Grant Currie whose farm was at the back of Peacehaven. Most of us ended up with nicknames that have stayed with us to the present day when we see one another occasionally, which is not very often now as most of us have moved on. Pat's nickname was Dickey Dooley, mine was Titch & also Tiny, another girl was known as Margie kneecaps (because of her protruding knees) & another poor girl was known as Mankie (god only knows how she got that one) I think my sister was just Col from what can remember & there were many others that I can't remember off hand. We had free travel to & from work by an open backed cattle truck, the seating was upturned vegetable bushels in the mornings & filled bushels in the afternoons with the produce that we had picked during the day (no health & safety on those days) after we had all been dropped off in Brighton the truck then went on to the Municipal Market to deliver the produce to be sold. In the summer we would mainly be working on the Peacehaven farm planting, hoeing, & cutting the taller weeds down with scythes & picking salad vegetables. As it was very hot working on the farm during the summer we would only wear bikinis & flip flops while we worked & just cover up with shorts & tee-shirts to go home in. We worked to a quota system so we would all work as fast as we could as when the quota was done we could all go home & as we were not far from Brighton we didn't wait for our free transport to take us home so we would all walk down to the South Coast Road & hitchhike in twos & threes, we were mainly given lifts from drivers that we got to know so we never had any problems but I wouldn't recommend doing that nowadays! We all went to the Lyons Tea rooms at the bottom of St James Street for tea or coffee before going & getting a beano pie from the hot pie shop further up St James Street & eating them on the way back to Whitehawk, I can still taste those pies to this day!! During the winter we would mainly be picking sprouts on other farms around Sussex i.e. Telscombe, Thakeham, Barcombe, Piddinghoe, Southease etc. We never hitched lifts from places other than Peacehaven; we travelled back in the cattle truck from the other farms. 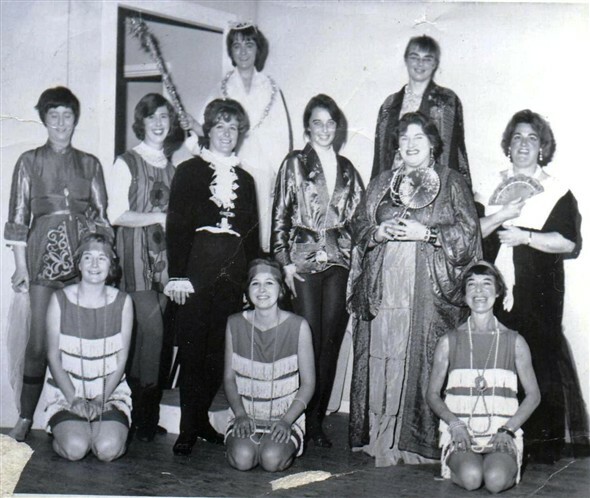 In the summer of 1966 we did a pantomime for the pensioners of Peacehaven 'Cinderella' I think we enjoyed doing it as much as the pensioners enjoyed watching us making fools of ourselves, I am the one with the wand (the fairy godmother) note that I lost both my wings when the scenery fell on me during the show!! We had great fun during rehearsals & even more fun on the night!! The attached photo of the pantomime was published either in the Evening Argus or The Brighton & Hove Gazette; I can't remember which one now. This page was added on 18/07/2008. Hi i'm looking for a friend of my mum. I know they both worked at Grant Currie. My mum's name was Valerie Mann and has now sadly died. Her friend was Paula Butcher, if you do remember them could you please reply. Thank you. Trying to find anybody who worked at Grant curries farm from 1947 - 1950's for my Mum Kathleen Bailey..